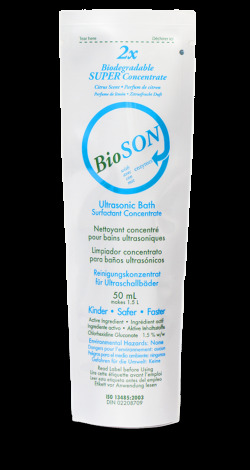 BioSON is concentrated universal device detergent. This unique formula contains four enzymes that rapidly break down bioload. It contains antimicrobial additives to reduce the odours and bacterial aerosols created by the ultrasonic bath. It can also be a very effective instrument pre-soak and multi purpose detergent.